How can retirees reconcile their practical need for capital appreciation with their strong emotional desire for capital preservation? Active, risk-managed strategies can provide an appropriate addition or alternative for advisors and their retirement clients to passive, buy-and-hold strategies in answering this question. The two market crashes of the 21st century have had a profound effect on investor behavior. According to Betterment, 65% of investors say their risk tolerance has changed since the Great Recession—and 59% say their finances have not recovered fully from that period. A 2017 Gallup Survey found that stock ownership in the U.S. has dropped significantly since 2008. These issues are particularly important for individuals or couples on the cusp of retirement, or those already in it. It’s uncertain how long today’s retirees might live, but the one thing they want to know is that their money will not run out during their lifetime. Answering this question in a positive fashion requires combining capital preservation with the opportunity for capital appreciation. “It is very difficult for a retiree to recover from a market decline if the individual also needs to be making withdrawals from the portfolio to meet living expenses. The drag from withdrawing funds from a retirement portfolio can quickly turn a market downturn into retirement shortfall. It’s all a matter of math. For advisors with a focus on retirement income planning, understanding the role a risk-managed, active investment approach can play as part of a retiree’s total retirement planning is critical. Also critical for financial advisors is understanding the current mindset and attitudes of their target segment. We want to thank the American Institute of CPAs (AICPA) for permission to excerpt commentary and findings from the Personal Financial Planning Trends Survey they conducted in 2018. This study provides some valuable insights from CPA financial planners on the current concerns expressed by their clients who are approaching retirement. “Nearly half (48 percent) of clients have expressed concerns about outliving their money, according to the survey. 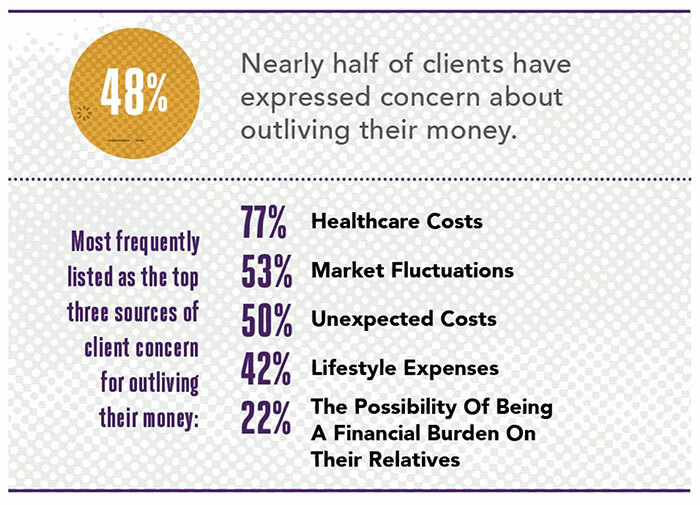 Interestingly, that outweighs the 39 percent of planners who have concerns about their clients outliving their money. This underscores the extent to which even well-positioned clients are stressed over the prospect they’ll outlive their cash. “When asked about the top three sources of client financial and emotional stress concerning outliving their money, healthcare costs (77 percent), market fluctuations (53 percent) and unexpected costs (50 percent) were cited as the top issues. Additional causes for financial stress include lifestyle expenses (42 percent), the possibility of being a financial burden on their relatives (22 percent) and the desire to leave an inheritance for their children (21 percent). Source: American Institute of CPAs (AICPA), 2018 Personal Financial Planning Trends Survey. 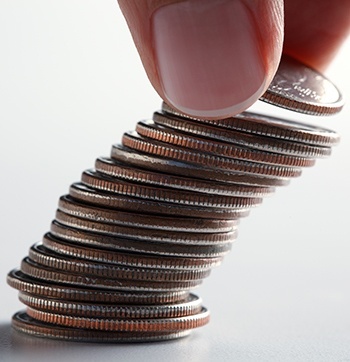 “Even with adequate planning, retirement becomes more complicated as clients age. In fact, 57 percent of CPAs are seeing long term care issues impact their clients’ retirement planning more frequently than they did five years ago. Only one percent saw this issue crop up less often, with 42 percent saying they had not seen a change. Fifty percent of CPAs saw an increase in clients taking care of aging relatives, with only 3 percent seeing this issue less often, and 47 percent saying about the same as five years ago. The survey also found 45 percent of CPAs citing diminished capacity as an issue impacting clients’ retirement planning more often (3 percent less often, 53 percent about the same) than five years ago. The conundrum many retirees, as well as their financial advisors, face is how to reconcile a mindset that fears “going broke” and fervently wants to avoid steep portfolio losses with the likely need for portfolio growth via equity strategies to keep funding retirement—at the very least keeping up with inflation. This fear is not surprising, given that the broad equity market, as represented by the S&P 500, has suffered drawdowns of 49.1% and 56.8% just in this century. “Buy and hope,” purely passive investing is, therefore, a poor alternative for most investors—especially retirees—versus a holistic portfolio approach that includes dynamically risk-managed strategies. While it is true that markets over a long enough period have an upward, positive trajectory, strictly passive investing has many issues, not the least of which are investor discipline and controlling one’s emotions. Further, the “sequence-of-returns” dilemma undermines even very capable application of traditional passive asset-allocation approaches. As numerous studies have shown, when clients are in the distribution phase of retirement, the sequencing of their investment returns can have disastrous effects on the long-term viability of generating an income stream. Put simply, two portfolios may have the exact same “average return” over a 20- or 30-year period, but the timing of those returns can mean the difference between building a very comfortable retirement trajectory and simply running out of money. The real question is how can investors best achieve their personal return objectives—“goals-based” investing—given their specific financial situation, time horizon, risk appetite, and retirement planning outlook? Active, risk-managed strategies can provide an appropriate addition or alternative for advisors and their retirement clients to passive, buy-and-hold strategies in answering this question—through full market cycles. These strategies can react and adjust to different market conditions and economic regimes, seek to avoid extreme market highs and lows, and smooth the way through volatile markets.